Obtain a copy of your credit report and find out exactly what is on there and understand why it is there. 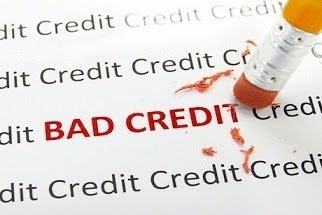 If there is any information on your credit file that you believe should not be, follow up the creditors to find out why they have listed this adverse history on your credit file. You can get a copy of your credit file for free online try a service like this one. Try and come to a resolution, and if you believe that it is on there on error, take further measures to resolve this issue as leaving it there will only make matters worse. Using some of those credit repair companies may assist you in removing defaults on your file that the creditors did not follow the correct procedures when listing those defaults on your file. These legal companies understand exactly what is required in order for a default to be listed, and quite often big companies are not following the right steps and if they cannot evidence that they have, this can result in them being made to remove your default from your credit file altogether. Unfortunately getting legal advice is never cheap but you can shop around online. Engaging the services of a professional car finance broker can increase your chances of obtaining a bad credit car loan. Find one that specialises in bad credit and deals with these types of loans every day. They will have the most knowledge in regards to the lenders that specialise in bad credit and can guide you every step of the way to ensure you apply at the right time and present your application in the best possible light to maximise your chances of a car loan approval. Bad credit car loan financiers are more likely to review your bank statements for all your income and expenses. Although they may request pay slips or other forms of proof of income, they will also assess your bank deposits to see if these are in line with your payslips. What is the most important thing they will be looking for on your bank statements though is how you manage your own personal day to day finances. If you have overdrawn on your bank accounts or don’t have sufficient funds in your account for any direct debits that are set up, your account will go into a negative amount, and this will look poorly on your application, so keep your banking conduct as clean as possible. If you have just started a new job, you may have to wait until your probation period is up prior to applying. If your employment history is instable, which means having many jobs in a short period of time, or having large gaps in between jobs, this will make it very difficult to get a bad credit car loan. The financier is relying on your income to get their car loan repayments, so they want to make sure your income is secure. Try and stick with your jobs as long as possible and be comfortable that your income and job are secure prior to applying.